Conceal cables and power for your wall mounted TV Introducing the all new ONE-CK in-wall power and cable management system. Single-gang size all-in-one design. Designed to simplify wiring behind wall-mounted flat-panel TV's This discreet system allows low voltage cables and wires to be routed through the wall for a clean look. Code Compliant to install power, includes hardware and helpful mounting template make the ONE-CK the perfect do-it-yourself solution for any skill level, without the need for an electrician. No wiring, simple snap together PowerConnectors make this safe and easy. Partner a SBCK kit for your soundbar power or use a CKRE if you need longer in wall power wire. In-Wall Cable Management System for Wall Mounted Flat Screen LED, LCD, and Plasma Televisions. This kit includes a single Power Outlet for mounting one (1) TV. No more messy cables hanging down the wall between the TV and the floor. No electrician needed with snap together Power Connectors. This system allows for Wall Mounted TV's to hide low-voltage cables and wires routed behind the wall for a clean look. 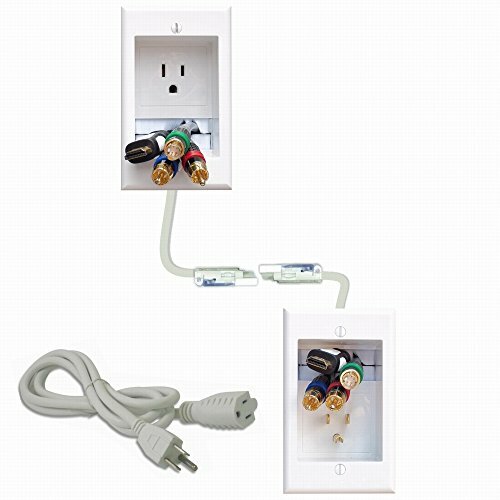 The Included In-Wall PowerConnect Cable and 6-foot Power Cord is code compliant. Does not include HDMI Cables or other Low Voltage Audio Visual Cables. Included Recessed wall mount plates are hidden behind Flat Screen TV Mount and should work with the thinnest TV mounts and thinnest TV's on the market. Top Rated Product with Simple Easy DIY Installation. If you have any questions about this product by PowerBridge Solutions, contact us by completing and submitting the form below. If you are looking for a specif part number, please include it with your message.